It’s not unusual for composers to think very highly of themselves, but Karlheinz Stockhausen seems to have turned ego into a whole new art form. As he’s no longer with us, that might just be considered a matter of historical interest, but, sadly, his devotees seem to be continuing the adulation, both of the man and the music: not helpful for the rest of us trying to contextualize and rate his undeniable achievements. Clarinetist Michele Marelli worked with Stockhausen for 10 years and he’s clearly one of the true believers. His liner note essay is cringingly sycophantic, causally referring to Stockhausen as a ‘genius’ and ‘Maestro,’ and to WOCHENKRIES, one of the works presented here, as ‘a masterpiece,’ as if any debate on the matter was wholly redundant. It’s not a masterpiece, and nor are any of these works, at least not when judged against his finest scores. Nevertheless, Stockhausen wrote well for the clarinet, and much of the music here, which dates from the 1970s and 80s, is engaging and original. Marelli writes that the theme of the album is joy. Ever loyal, he focuses specifically on “the joy that the act of composing aroused in Stockhausen,” but he sells himself short: The music is indeed joyous, but seems so more for the enthusiasm of the player himself than for anything intrinsic to the compositions. Marelli’s clarinet tone is unusual, quite woody and not particularly round. That allows him to focus in on the individual pitches, even in fast passages, but means he has to work harder to make the music sing. Stockhausen generally avoids extended performance techniques in these three works, instead employing a very gestural, even theatrical, mode of musical discourse, often based on simple motifs, runs, and series. Marelli tells us that much of this music is very difficult to perform, but he takes it all in his stride. He makes it sound easy, and that can be a problem. Like many new-music specialists he’s in a conundrum: The composer has taken his virtuosity for granted and written apparently difficult music that generally doesn’t sound so. We just have to take the player’s word for it. 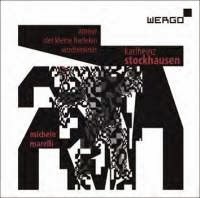 The album opens with AMOUR, five vignettes written, as Marelli tells us “as gifts for women whom Stockhausen was deeply connected to.” It adds up to a lively suite, aphoristic and surprisingly unassuming. The only slightly distasteful aspect is the sheer number of movements that make it up. Marelli is, I think, being coy in his description of the work’s multiple inspirations, and a less charitable interpretation could have it that Stockhausen is using the format to brazenly flaunt his polygamous lifestyle. One of the women “whom Stockhausen was deeply connected to” is the clarinetist Suzanne Stephens, who was the inspiration for DER KLEINE HARLEKIN (the all caps titles don’t exactly suggest modesty either, do they?). This is one of Stockhausen’s most often performed works. It’s been recorded many times too, but loses something in audio only format. The piece requires the player to dress up and to dance, and the music is only one aspect of the performance. Nevertheless, Marelli always ensures there is plenty of theatricality in his reading, and he gives a technically impressive performance. It’s a very similar piece to AMOUR though, and you can easily miss the switchover if you’re not paying attention. The last piece on the album, WOCHENKREIS, was another project instigated by Suzanne Stephens. In fact, it could be argued that the piece is by Suzanne Stephens, at least in collaboration with Stockhausen’s son, Simon. In 1988, the two of them made this arrangement, for basset horn and synthesizer, of music from Stockhausen’s MONTAG aus LICHT. Stockhausen himself tells us that “In subsequent rehearsals with me, this version found its final form,” which sounds like a slightly desperate appeal for the work to be considered echt Stockhausen. That would be much easier to accept it were not for the synthesizer part. No doubt this was the state of the art in 1988, but the noises that come out of the instrument are just dreadful: course, undifferentiated, and continually grating on the ear for the full half hour duration. Given that Stockhausen is rightly considered the godfather of electronic music, presenting this quantity of amateur-sounding synthesizer music under his name does his reputation no favors at all. No doubt there are many recordings out there of Stockhausen’s music for clarinet. The only other one I’ve come across is the bass clarinet and piano recital by Volker Hemken and Steffen Schleiermacher (MDG 613 1451-2), which is an excellent introduction to the composer’s instrumental and chamber works, and is far more enjoyable and interesting than the disc at hand. This review appears in Fanfare Magazine, issue 37:5. Once upon a time, a recording of Ligeti’s seminal orchestral scores of the 1960s and 70s would have been considered a brave and unusual undertaking. Not any more though, as both the size and quality of the Ligeti discography take the novelty off any new additions. That’s not to say that new releases aren’t welcome though, and successive recordings have shown that different performers can bring new perspectives to these works that predecessors may have overlooked. The Finnish conductor Hannu Lintu provides a fascinating liner note to his new release, in which he rightly points out that, despite the Modernist aesthetic, Ligeti’s music makes interpretive demands on its performers that are more akin to the Romantic repertoire. Not only do the technical issues have to be resolved according to subjective criteria, but expression must be conveyed through the music too. In fact, Lintu’s reading of these scores equates the music’s meaning with the technical challenges of its performance much more than his words suggest. In a later passage of the liner, he discusses Atmosphères and makes the following statement: “What is exceptional in Atmosphères in the context of Western music is that the performers are utterly unable to determine what material is important and what is less important. The whole work seems to occupy the same level of attention, and no sense of depth is created because the various elements are all of equal weight.” I’m not sure that’s true, but it proves to be the credo by which all the works are interpreted. Lintu and the Ondine engineers studiously avoid any concept of depth that the music might suggest at either literal or metaphorical levels. So the microphones are placed close to each section, closing up the sound stage and preventing any sense of physical perspective across the orchestra. Dynamic levels are kept even, with the result that lines and textures that other conductors may consider peripheral are here given elevated prominence to bring them to a state of equality. The orchestra has clearly been very well rehearsed, and from a technical point of view this might be the most accurate and proficient reading of all four works now available. But, as Lintu himself states, just playing the notes isn’t everything, and interpretation-wise, each of the works struggles when compared with the best of the competition. That, in my opinion, is the Ligeti Edition (at least for the purely orchestral works), which began on Sony, but by the time it had reached these scores had transferred to Teldec. Jonathan Nott’s recording with the Berlin Philharmonic (Lontano, Atmosphères, and San Francisco Polyphony all appear on Teldec 8573-88261-2) makes full use of the finest technology available at the time (2002) and of the finest orchestra too. The rich and distinctive BPO sound benefits every aspect of the music, and the velvety string sound is a particular asset. The soundstage is deep and involving, allowing the minute details of the score to appear from different corners of the orchestra, and to subtly mingle, but without ever blending into undifferentiated blocks. Lintu’s recording has detail as well, but it is presented in a more matter-of-fact way by an orchestra with a clearer, less distinct sound, and engineering that strives for equality of balance at all costs. The results are more analytical, of benefit to students of Ligeti’s radical orchestration, but less so to listeners wishing to enjoy the music. The up-front immediacy of the playing and recording seems ironic in the context of Lontano, a work all about aural, physical, and metaphorical representations of distance. Even so, this performance is the best thing on the CD, with the accuracy of the ensemble proving particularly beneficial, and Lintu (or Ondine?) was right to put it first. Atmosphères feels cold and, well, not very atmospheric, while San Francisco Polyphony generates the ideal sense of disorientation in the opening passages, but becomes wearing on the ear in a way that other recordings don’t. The Violin Concerto is also very well represented on disc. A recent favorite is the Patricia Kopatchinskaja recording with Peter Eötvös (Naïve V 5285, reviewed 36:4), in which the Eastern European folk roots of the music are brought to the fore in a lively and utterly distinctive reading. Benjamin Schmid is at the other end of the scale, and like Lintu, he provides a documentary account, avoiding needless idiosyncrasy. Technically, his is a proficient reading (which is saying something), but it just feels too reserved. The one exception is the Aria second movement, in which he brings a rich and attractive viola-like tone to the low-register melodic lines. Lintu again brings out every detail of the orchestration, revealing all sorts of curious anomalies and clashes (the orchestral strings are tuned to a range of competing standards and temperaments). This is occasionally to the soloist’s detriment though, especially as the engineers give the orchestra much more prominence over him than either the score suggests or his projection allows him to compete against. Pursuit of detail is clearly what has motivated Hannu Lintu in this project, so it is a shame that the disc was not released in SACD. When it was independent, the Finnish Ondine label issued many of their releases in SACD, but after it was bought by Naxos this came to an end, in line with the latter company’s aversion to the medium. 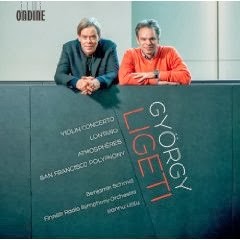 While all these works have been recorded many times before, neither they, nor, I think, any of Ligeti’s works has yet appeared on any high resolution format (apart from one recording of the Horn Trio on BIS). Given the levels of complexity and detail in these scores, that seems like a missed opportunity. In a high-resolution format, this recording may have had something unique to offer, especially given the attention those details have clearly received from conductor, players, and engineers alike. As it is, the recording sits somewhere near the top in a competitive field, but all of these works are available elsewhere in more convincing and more engaging readings. This review appears in Fanfare Magazine issue 37:4.